A ClydeUnion BB3 pump manufactured in Burlington, Canada and Glasgow, UK. In an order valued at more than US$10 million, SPX Flow will provide 20 BB1 5000 hp pump packages to the Midland-Sealy Crude oil and condensate pipeline. The pumps will be manufactured in Burlington, Canada and Glasgow, UK. 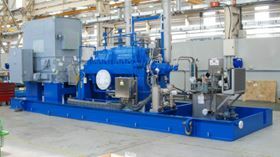 SPX Flow’s Glasgow facility will also assist with testing and assembling the pump skids. These pumps will be installed as part of the new 400 mile pipeline that runs from Midland, Texas to the existing terminal at Sealy, Texas, which is connected to the Houston crude distribution pipeline network. SPX Flow will also supply 2-stage ClydeUnion Pumps BB3 pumps to the Sand Hills pipeline project expansion in a contract worth more than US$2 million. This follows a previous order for SPX Flow’s BB3 pumps on this project. The pumps will help to transport natural gas liquids (NGLs) sourced from the Permian and Eagle Ford basins to the fractionation facilities in the Mont Belvieu, Texas area.